Hospitals lose millions of dollars per year due to inadequate sterilization procedures and storage. This is especially true when it comes to the storage of blue wrapped kits, as they are easily torn during handling. 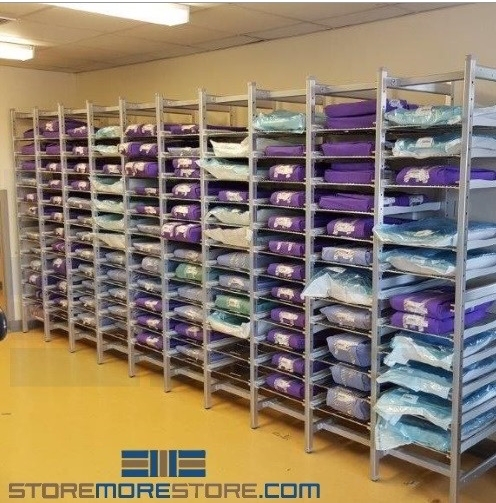 Wrapped surgical instrument tray racks greatly reduce this risk by eliminating the need for the wrapped kits to be touched until they reach the operating room. Just a single perforation makes a wrapped instrument kit unsterile. If an unsterile kit reaches the operating room, it’s sent back to be re-sterilized—wasting time and money. This is also an incredibly easy way to spread hospital-acquired infections, which has been a growing problem for hospitals. The good news is that these tears and perforations are easily preventable. With slide-out transport trays and silicon tray mats, the instrument kits never need to be touched again until they are ready for use. Stacking also increases the risk of tears and perforations. 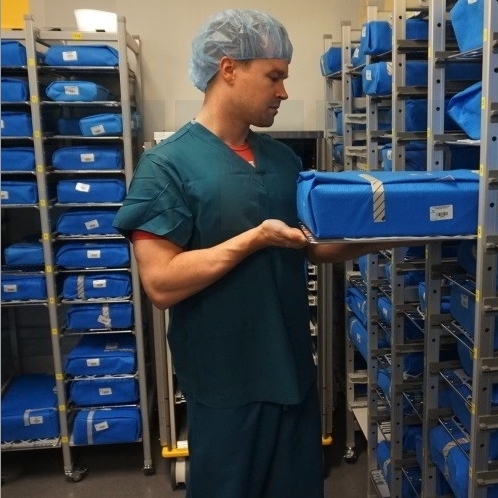 Since each instrument kit has its own storage tray, hospital staff also don’t need to stack the kits on top of each other during storage. As an added bonus, the racks also store trays in the least amount of space needed so you can store more in a smaller footprint. Weld-free frames made of specially formed hygienic anodized aluminum tubing (approximately 1 ¼” square) with steel spacers. Post fronts fitted with thermal plastic bumpers prevent damage to the racks. Support rails made of patented injection molded plastic and adjustable in 3″ increments. The support rails allow the wire trays to slide in and out safely. Chrome plated wire storage trays (23 ½” x 11 ¾”). Each vertical frame equipped with two double 2″ non-marking swivel wheels. The front wheel includes a wheel lock to keep the racks in place. Wheels have a load capacity of 155 lbs. during transport and 310 lbs. when static. Larger casters available for more extensive purposes. Choose from multiple accessories including wire and plastic baskets, shelves, doors, catheter holders, dividers, label holders, and more. Wrapped surgical instrument tray racks are available to buy online and ship in 10 to 15 business days. For more information or if you need assistance, call us toll-free at 1-855-786-766.